Where is the University of Bayreuth? Where on campus is the Kuhnlab? The Kuhn laboratory is located in the BIOmac annex of the NW I building on campus. 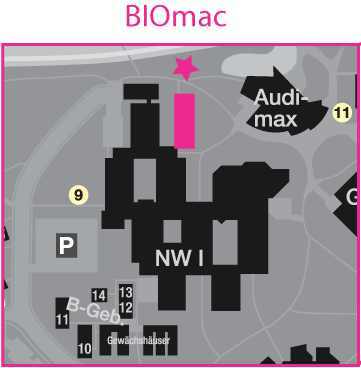 You can find is by either following the signs for BIOmac from the main entrance of NW I or by entering the BIOmac annex directly. It is located just next to the main lecture hall (Audimax). To gain access to the BIOmac building please call 4354, 4386, 4391 or 4356 using the intercom located next to the entrances to the BIOmac annex.